The Air Force on Monday bid farewell to two members who each served as the ultimate wingman — actually carrying colleagues on their backs through many critical missions. Willie and Judge, military working horses, retired following “distinguished careers” as dozens of fellow 30th Security Forces members and equine counterparts watched at Vandenberg Air Force Base. Judge, a 27-year-old quarter horse, recorded 20 years serving the Air Force, first at Howard AFB, Panama. Willie, an 18-year-old Arabian, logged 14 years of active-duty service after being acquired from a ranch in Northern California. The event at the Missile V on California Boulevard included all the usual features of a military sendoff — key commanders on hand, a medal presentation and a final salute. What wasn’t usual were the 1,200-pound, four-legged retirees sporting saddles and bridles. That does explain, however, the presence of their law enforcement counterparts from the Santa Barbara County Sheri’s Mounted Unit, who stood silently nearby on the grass near the Minuteman missile on display. “Recognizing a member who is retiring from a career of long and honorable service is one of the oldest traditions of military service,” said Tech. Sgt. Erin Panas, mistress of ceremonies. “A retirement ceremony is a prestigious event and the highest honor that we can give a retiring airman.” The military working horses are key for airmen patrolling the sprawling 99,400-acre base, where terrain ranges from remote sandy beaches to rugged hills choked with chaparral. The base is the Air Force’s third largest installation. Vandenberg is the only Air Force installation that still employs military working horses, officials said, explaining that the animals are used for conducting patrols, search and rescue, crowd control and surveillance. The base’s military working horse unit began in 1996 to employ “a more environmentally friendly mode of transportation” for the 30th Security Forces Squadron’s game wardens, according to Lt. Col. Michelle Stringer, the unit’s commander. During their careers, Willie and Judge were involved in several key missions, such as helping locate lost hunters and patrolling areas around Titan or Delta 4-Heavy launch facilities prior to blastoffs. “When activists tried to disrupt a launch on north Vandenberg, Judge and Willie were there,” Stringer said. “They walked up right up to the activists hiding behind bushes. They have always answered the call. “Of course, who could forget the long strolls on the beaches during snowy plover season. I don’t know who enjoyed it more: the horses or the handlers,” she added. “These two horses have served the 30th Security Forces Squadron and Vandenberg Air Force Base with distinction ...” Stringer presented each horse a meritorious service medal, the red-and-white ribbon with a brass circle depicting an eagle to their tack as the citation was read aloud spelling out their accomplishments. In reading the retirement orders, Stringer noted that the pair of military working horses retire “in the grade of sergeant,” drawing chuckles from the crowd. At the end of the ceremony, the Horse’s Prayer was recited as handlers Staff Sgt. Andrea Lewis and 2nd Lt. Joshua Trayers removed their saddles. They then walked Willie and Judge to a formation of security forces members who rendered a final salute to their four-legged colleagues. Afterward, humans feasted on cake while horses snacked on apples and carrots. Retirement for the pair will take them to the 10-acre Jack Auchterlonie Memorial Equine Sanctuary, or JAMES, in Twentynine Palms. “They’ve earned it,” Trayers said of his equine colleague, Judge. “It is a little sad. It’s like a member of your unit leaving.” Once at their retirement home, they will assist with events for disabled individuals and children as well as rehabilitation of other horses that are brought to the sanctuary, officials said. That’s also where Vandenberg’s other retired horses, Sarge, Alamo and Duke landed, with their military duty spelled out on the nonprofit group’s website, www.jamesrescue.com/. After Judge’s and Willie’s retirements, the four-person Mounted Horse Patrol unit still has six young horses to fulfill the duties, although two remain in training. Knowing the retirement plans, Lewis said he couldn’t be sad by Monday’s retirements. “I’m thrilled. I’m not sad. I know where they’re going is a great place,” added Lewis, assistant noncommissioned officer in charge of the squadron’s mounted horse unit. 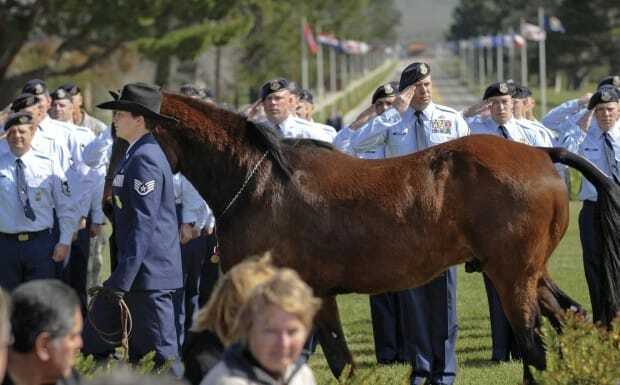 Military working horses Judge, a 27-year-old quarter horse, served the Air Force for 20 years. Willie, 18-year-old Arabian, served 14 years on active duty. Judge patrolled 12,000 miles of jungle in Panama. Judge helped capture 100 trespassers at Howard AB, Panama. Judge and Willie patrolled VAFB beaches. Both patrolled around launch sites to ensure the areas were clear. Both worked crowd control for 15 protests at VAFB. Both familiarized Navy Seals with horseback riding tactics in rugged terrain prior to their deployment to Afghanistan.